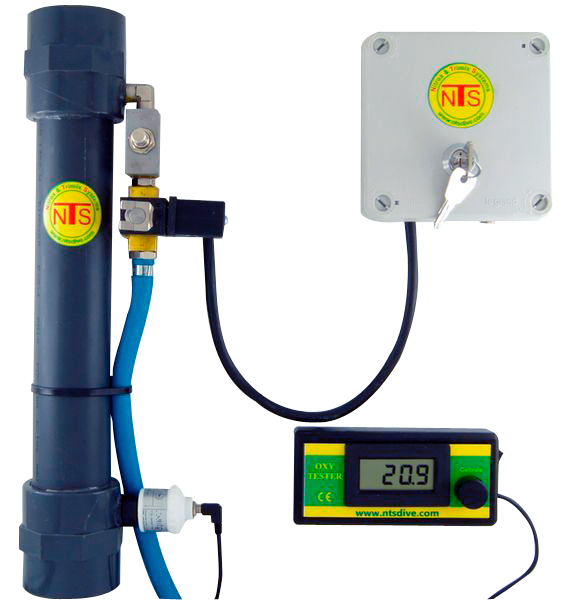 Nitrox blender with electro-valve which cut the arrival of oxygen in case of stop of the compressor. The analysis of the rate of oxygen is made by connecting the OxyTester unit on the analysis base. The gas injection is made trough a manoregulator monted on the tank and a flow regulator which are supplied. A special Oxygen electro-vlave cabled on the compressor’s contactor allows to cut the supply of Oxygen in case of stop of this one. A first step to the safety.